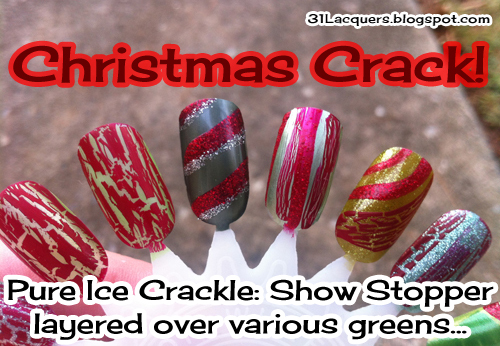 31 Lacquers: Holiday Nails: Christmas Crack! By now, you've seen hundreds of nail art designs for Christmas. I'm lazy and not patient enough to recreate those designs for you. Instead, I have a couple of images I'm calling "Christmas Crack." 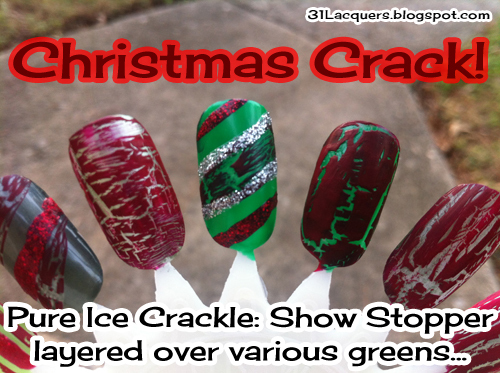 These designs feature Pure Ice Crackle: "Show Stopper" (a red crackle polish) over different greens. In the image above, the greens are: Icing "Lucky Luis" (first two nails), Max Factor Diamond Hard "Momentum Moss" (red and silver diagonal stripes), Sally Hansen Color Quick "Green Chrome" (vertical crack and red glitter striping), China Glaze "Zombie Zest" (red glitter striping curves and cracked swoosh), and China Glaze "Mistletoe Kisses" (random vertical cracks). If my nails were long enough, I would have done them like the swooshy design. The designs above have the same "Show Stopper" red crackle polish over Max Factor Diamond Hard "Momentum Moss" (diagonals), Sally Hansen Color Quick "Green Chrome," fake mislabeled OPI green color (two nails), and then some green color that I can't identify. Oops. Basically, this was an experiment to see if the Pure Ice crackle would work better on these greens than it has for me in the past. I have tried using "Show Stopper" over white, but ended up with a smeared pink mess. I let the greens dry a LONG time before using the crack polish, so most of the designs turned out ok.
Do you have any of the Pure Ice Crack polishes? I also have the white one, but I'm not 100% satisfied with it or the red I used for these swatches. I really love these! Im just a recent convert to the crackle polish and these are some original Christmas nail art ideas...thanks! !